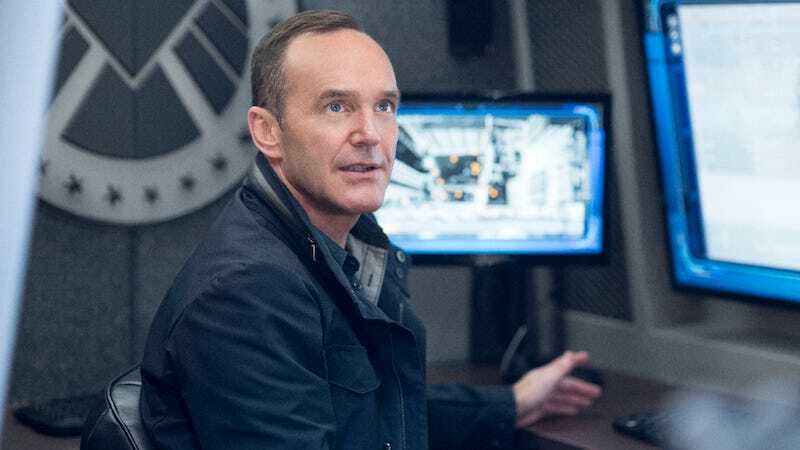 The midseason finale of Agents of SHIELD, “The Laws of Thermal Dynamics,” wrapped up most of the dangling plot threads from the beginning of the season—right up until it ended with a big ole twist that opened a huge can of worms. Most of “The Laws of Thermal Dynamics” had to do with our team dealing with Eli Morrow, who has a bomb that can take out most of L.A. He’s holed himself up in a compound with the requisite mooks to protect him, so Coulson suggests to the director that they go in with Daisy and Robbie, since their abilities would be useful. Oh, and Coulson tells Mace that AIDA is a Life Model Decoy. Mace is skeptical of Daisy, Robbie, and AIDA, and, to be fair, he is right that building AIs and robots has not always worked out well in this universe. Eventually, of course, the team—with AIDA and Radcliffe showing up to help—send the bomb to the dimension where, it turns out, Eli gets his powers from. He doesn’t create material, he shifts it over from another dimension. It’s the dimension that Eli ends up in, along with Robbie, who sacrifices himself in order to make sure Eli goes and stays there. The whole series of events makes Daisy ill, so she has to get rid of the quake building up inside her. Unfortunately, while she does so safely, she also does it in public, revealing her connection to SHIELD. Mace takes this opportunity to declare Daisy a hero and, by declaring her a part of SHIELD in the press, officially ties her to his authority. With that done and Robbie “gone” (Coulson doesn’t believe forever, and neither do I), Senator Nadeer can’t blackmail Mace anymore. We even get Yo-Yo and Mack ending their “will-they-won’t-they” plot with a kiss, Daisy getting a new SHIELD lanyard, and Melinda May agreeing to a drink with Coulson. An unconscious May. And so, after everyone’s LMD theories about Coulson being proven wrong in season one, we finally have a SHIELD agent getting replaced by one. Of course, it’s a hostile action rather than the traditional “decoy” use, but still. Eli Morrow (and his amazing powers) and Robbie (and his amazing flaming skull) are both gone, at least for now. Nadeer has been neutralized as a threat, at least a bit. Daisy’s back in the fold. And Mack and Yo-Yo are together. That’s a lot of resolution for a midseason finale. So now we just have to wonder how long we’re going to spend feeling awkward every time we see Coulson and LMD May when the show returns. We’re also going to be thinking about what the plan is here. And whose plan it is. AIDA’s? How much does Radcliffe know? I mean, it’s information gathering, right? But for what? Why?